DFDS is more than 150 years old! Help us celebrate this remarkable achievement! It was on this day - December 11, 1866, that DFDS was born - four shipping companies were brought together into one by Danish financier C.F. Tietgen. We wouldn't still be here today, 150 years later, stronger than ever, without our relationship with all of you, our customers and passengers. Thank you, from our CEO Niels Smedegaard and all of us in DFDS. On December 11, 1866, DFDS was founded by Carl Frederik Tietgen. He was a visionary and today, 150 years later, we continue carry on his vision - still moving goods and people, well into the 21st century. How do you celebrate a 150 year anniversary? Set a world record, of course! On August 17, 2016, before an audience of employees and friends of DFDS, at the DFDS Terminal in Copenhagen, Lauritzen Fund Director Inge Grønvold christened the latest member of the DFDS fleet, Jubilee Seaways. At the same event, an adjudicator from Guinness World Records was on hand to confirm that the ship, which is built of more than 1 million LEGO bricks, at 12.035 meters, was indeed a new world record for Largest LEGO Ship! The ship was built over the summer by all the employees of DFDS - 7000 employees in 70 locations in 21 countries contributed to the project. The bricks they built were sent to Edinburgh, where the ship was assembled by professional LEGO artist Warren Elsmore and his team of LEGO master LEGO builders. When finished, the ship was shipped, using DFDS' own network, of course, from Edinburgh via road to Immingham, where it was sailed to Esbjerg and then shipped on via road to Copenhagen. Luckily, we built it onto one of our own DFDS trailers for easy transport! 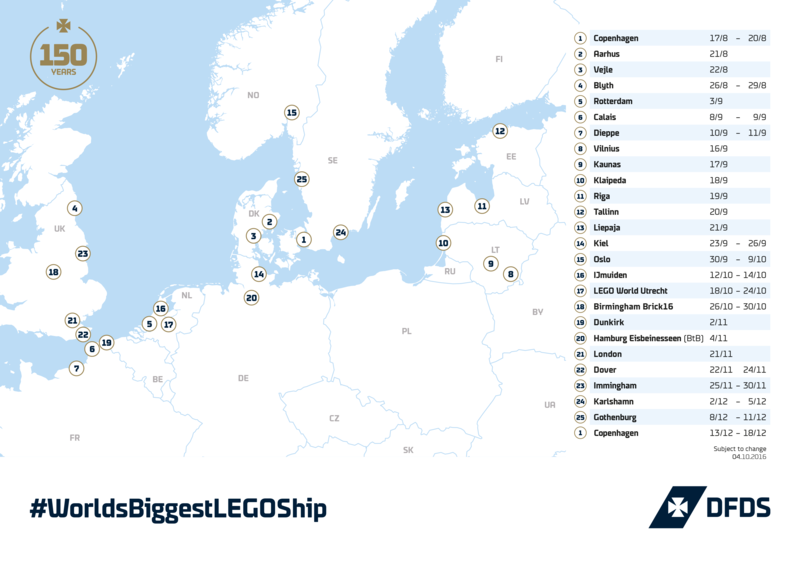 The ship is on a grand tour of DFDS Terminals and offices all summer and winter until its scheduled journey ends at LEGO World in Copenhagen in February 2017. After that, we will have to wait to and see where it will end up. Keep an eye on the DFDS Group Facebook page for the latest information on where you can see the ship. We are pleased to announce that Živilė Čepulytė, a student at the Vilnius Art Academy in Lithuania, is the winner of our 150th anniversary poster competition. Among the more than 400 entries, her simple, elegant design stood out from the pack, catching the jury's eye immediately. The jury, which consisted of Finn Nygaard from Denmark, Kari Piippo from Finland and Uwe Loesch from Germany, as well as our own Director of Marketing Rikke Gransøe Lange and CEO Niels Smedegaard enthused, "This poster is simple, though simply the best. The composition is good, it has an optimistic feeling, provides a link to the future. You get the sense that business will continue for another 150 years." They further cited the work's playful attitude, "It's playful and spontaneous, but it still has a story. It' s beautiful, but not too serious. Furthermore, it fuels the imagination, you have to dig into the layers to find all of the details. You get the feeling that you can continue building." Runners-up, in no particular order, were Paulius Petrauskas (Vilnius, Lithuania), Agne Mackeviciute (London), Jekaterina Aleksejeva (Vilnius), Andres Muñoz Claros (Hamburg, Germany) and Mirjam Siim (Portugal). They will each receive a prize of €650 and their works will be featured in a postcard series.